TEXTILE HISTORY, like the Pasold Research Fund itself, is dedicated to the study of all aspects of textile and dress history. 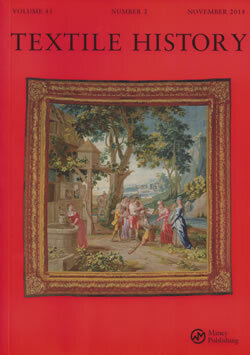 Interdisciplinary in approach, international in scope and covering all periods of history, this peer-reviewed journal, published continuously since 1969, serves as a forum in which scholars and practitioners from many disciplines share their work, throwing new light on the past, exploring emerging trends and technologies, and developing the study of society through textiles. Mixing critical analysis, archival research, rich descriptions and fresh insights into cultural phenomenon, TEXTILE HISTORY is known as the journal of record for the economic, social and cultural history of textiles; the material culture of cloth and other fabrics; technological development and innovation; design and the history of dress and adornment; domestic and symbolic textiles and other textile uses, including the exhibition, conservation and interpretation of historical and anthropological textiles and clothing, from prehistory to the present. TEXTILE HISTORY has received the top ‘A’ ranking from the European Science Foundation. This means that the European Science Foundation recognises that the journal is an international publication with high visibility and influence among researchers in various research domains in different countries, and that it is regularly cited all over the world. An annual prize is awarded to the best article published in TEXTILE HISTORY, selected by the editors and by members of the editorial board. Past winners are listed below. FOR AUTHORS: The Editors invite submissions that fall within the aims and scope of the journal. 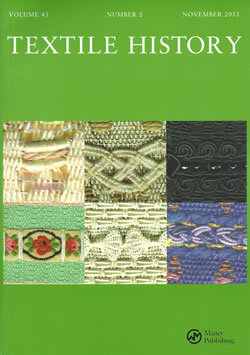 There are several options, all peer-reviewed: Research Articles (6,000-10,000 words), Object Lessons that explore ideas and issues based on the examination of a textile object or textile collection (6,000-8,000 words) and Research Notes that present new ideas and evidence, sometimes based on new sources, but which report or comment on these rather than giving an extended analysis (also 6,000-8,000 words). All submissions must be original and must not have previously appeared in any other form. Please contact the Editors if you are unsure whether your submission conforms to the requirements or if you would like to discuss your research prior to formal submission. Textile History welcomes submissions both from new and from more experienced scholars. The Editors also welcome exhibition, book and conference reviews (maximum 1,000 words), covering a wide cross section of events and publications from all parts of the world, dealing with all aspects of textile and clothing history. To suggest or discuss conference reviews, please contact the journal’s editors: Vivienne Richmond, (Goldsmiths, University of London) vrtexhist@hotmail.com or Marina Moskowitz, (University of Glasgow) Marina.Moskowitz@glasgow.ac.uk. 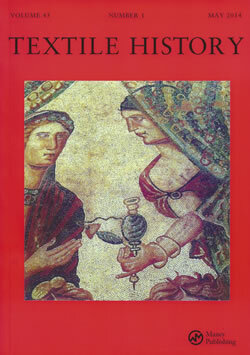 The current editors of Textile History are Vivienne Richmond, Goldsmiths, University of London and Marina Moskowitz, University of Glasgow. To discuss potential submissions to TEXTILE HISTORY or any aspect of the submission process, please contact Vivienne Richmond vrtexhist@hotmail.com or Marina Moskowitz Marina.Moskowitz@glasgow.ac.uk. 2017. Sarah Fee, '"Cloths with names": Luxury Textile Imports in Eastern Africa, c. 1800-1885', 48, 1. 2016. Pauline Reynolds, "Tapa Cloths and Beaters: Tradition, Innovation and Agency of the Bounty Women in Shaping a New Culture on Pitcairn Island from 1790 to 1850." 47, 2. 2015. Elizabeth Gernerd, "Pulled tight and gleaming: The stocking’s position within eighteenth-century masculinity", 46,1. 2014. John W. Stephenson, "Veiling the Late Roman House", 45, 1. 2013. Elizabeth Kramer, '"Not So Japan-Easty": The British Reception of Japanese Dress in the Late Nineteenth Century', 44, 1. 2012. Victoria Lopez Barahona and Jose' Nieto Sanchez, 'Dressing the Poor: The Provisioning of Clothing Among the Lower Classes of Eighteenth-century Madrid', 43, 1. 2011. 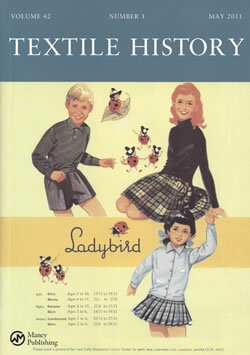 Kaori O’Connor, ‘The Ladybird, the Dressing Gown and Pasolds: Cultural Icons of the "Golden Age'"of British Childhood’, 42, 1. 2010. Marshall Joseph Becker, ‘Match Coats and the Military: Mass-Produced Clothing for Native Americans as Parallel Markets in the Seventeenth Century’ 41, Supplement 1. 2009. David M. Mitchell, ‘My purple will be too sad for that melancholy room’: Furnishings for Interiors in London and Paris, 1660-1735’, 40, 1. 2008. Sarah Cheang, 'Dragons in the Drawing Room: Chinese Embroideries in British Homes, 1860-1949', 39, 2. 2007. Clare Rose ''The novelty consists in the ornamental design': Design Innovation in Mass-Produced Boys' Clothing, 1840-1900', 38, 1. 2006. Harald Deceulaer, 'Between Medieval Continuities and Early Modern Change: Proto industrialization and Consumption in the Southern Low Countries (1300-1800)', 37, 2. 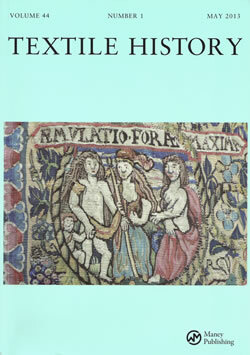 From 1983 until 2002 Textile History was edited by Professor Stanley Chapman (University of Nottingham). His work was continued by Professor Beverly Lemire (University of Alberta, Canada), Dr Lesley Miller (Victoria and Albert Museum, London) Professor Katrina Honeyman (University of Leeds) and Dr Mary M. Brooks (University of Durham).